The gym is attractive due to its convenience. It can also, however, feel a little bit too regimented. Sometimes, engaging in competitive or outdoor sports helps you see physical activities as more enjoyable and enduring. The next time you attempt to drag yourself to the gym, consider mixing it up with other, more exciting sports, many of which have roots in Asia. Muay Thai, or Thai kickboxing, has become a popular sport within the last few years. It is slightly different from North American kickboxing, which is a “four-point” fighting system. This means that participants can only work with their fists and feet. As an “eight-point” fighting system on the other hand, Muay Thai allows them to use their fists, feet, elbows, and knees. Commonly practiced as a form of self-defense and a fast weight-loss strategy, this combat sport has a lot of physical and psychological benefits. The strenuous techniques will wear you out, but your stamina, agility, and self-confidence will improve tremendously. Rigorous exercises are not for everyone. For those looking for a more calming workout, the Chinese martial art Tai Chi might be perfect. It is gentle and low-impact, but it has also proven to prevent and even treat age-related illness. Studies show that individuals with varying levels of Parkinson’s disease show improved balance, walking ability, and overall health after engaging in a number of Tai Chi sessions. It is suitable for all age groups at any fitness level. Often called “meditation in motion,” Tai Chi reduces stress and anxiety, while introducing serenity and inner peace. In addition, it can be applied as self-defense techniques. With spring just around the corner, try Tai Chi routines outdoors. Badminton was originated from British India in the 1800s, and it is currently the most popular sport in a number of other Asian countries. It has been said to be the second most popular sport in the world, just behind soccer. Over the last decade, China, Indonesia, and Korea have continued to dominate badminton world championships, most recently in the 2012 London Olympics. Like other aerobic sports, badminton has numerous benefits to the body and mind. It increases longevity, lowers cholesterol level, reduces the risk of heart disease, and prevents osteoporosis and breast cancer, among others. Table tennis, also known as ping pong, is another popular sport. Like badminton, table tennis was developed by British colonizers in India, who brought the sport back home. A seemingly simple exercise of hitting a lightweight ball back and forth on a 9-foot table, table tennis can be a very intense. It’s a fast-paced sport that trains one’s reflexes and eye-hand coordination. The minimal risk of injury from playing table tennis is a bonus. Sepak takraw is a sport unique to Malaysia and Thailand. “Sepak” is a Malay word for kick and “takraw” means a rattan ball in Thai. Conveniently, “sepak takraw” means to kick a ball. It’s also known as kick volleyball. When it was first invented, it was not a competitive sport. Rather, it was meant for the display of one’s lower-body strength and skills. 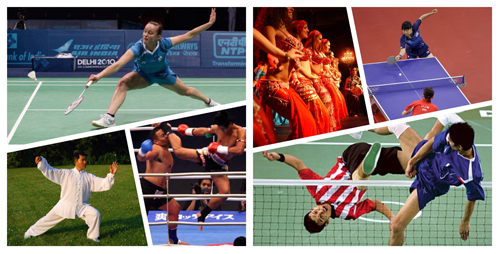 Now, it is one of the most popular sports in Southeast Asia. Several Southeast Asian countries are currently lobbying for sepak takraw — which has been labeled as “a flying spin-kick version of volleyball” — to be added to the Olympics.